If you are anything like me, your eyes are squeezed shut when you pass by the poor shelter dogs waiting in their cages to be adopted outside the local pet store. Unless you have the time, space and love to adopt a dog or cat, the experience is and will continue to be heartbreaking. It is time to unite as a community of dog lovers and help these animals. Looking to do something to help? There are ways to make a difference in a shelter animal's lives besides taking them home with you. You can donate food, collect towels and blankets, become a foster dog-mom, or volunteer some of your time at a shelter. 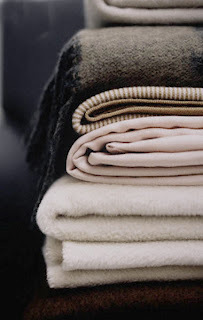 The ASPCA lists the Top Ten Ways to Help Your Local Shelter. Too little time to help? Here is something for you! The United States Postal Service will be issuing this year's social awareness stamp series: “Animal Rescue: Adopt a Shelter Pet” to increase public awareness about sheltered pets and encourage pet adoption and promote humane and responsible pet care. 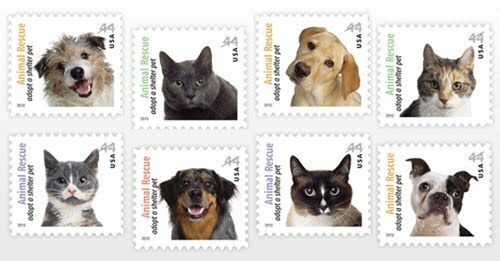 The stamps can be pre-ordered beginning today at usps.com/shop, stampstotherescue.com, or by calling 1.800.STAMP.24 (1.800.782.6724) and will be available on April 30, 2010. You can help by getting the word out to your friends and family to buy these stamps. As part of this campaign, Ellen DeGeneres and Halo: Purely for Pets, will be donating a million meals to animal shelters around the country. Small actions can make a difference for these animals. Thanks Debbie for posting this. I am going to join you in posting on my blog. We have 3 JRT's and the oldest was going to be put down because he was deemed "too old" for the place we got him from. The middle one has a nervous condition but has come far since he was a pup. And the third one is a typical crazy full of beans Jack Russell. They are such joy in our lives. Larry and I support a no kill shelter in our area, and I am going to blog about that and add this info into my post.